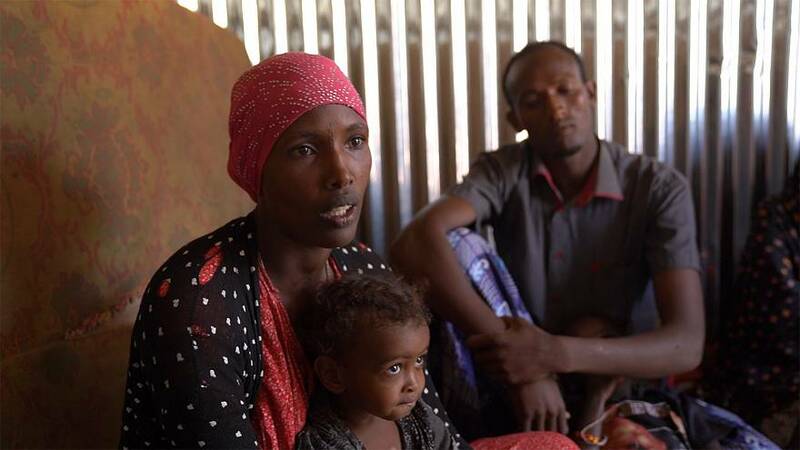 Of the 3 million displaced people in Ethiopia, over 1 million are in the Oromia region, southeastern Ethiopia. We followed the UN agency for Migration who are assisting in the region and visited the town of Deder. We expected to find a site for 8,000 displaced people. Instead of a camp, we discovered that families were living in sites scattered all around the area. These corrugated iron huts were built to host fifty families coming from the Somali region. We spoke to a woman about her experiences and prospects. "In Jijiga we participated in small trade after we were deported. We have lost all our resources. We would like to open a business here and to build a proper house". Another man also told us of his distress at losing all his property. "I have lost everything coming here. I have nothing for my future. I have no money, no business, no resources. I am unable to do or plan anything for my life". These iron huts host the most vulnerable families, but the vast bulk of displaced people here still live in empty administrative buildings. Many have spent the past year and a half camping in offices made available by local authorities. They complain that the aid they receive is not enough.